79 Main Street, Glasgow. G40 1QB. Tel: 01415542925. Victualler and Spirit Dealer James Denholm occupied licensed premises on this site in 1849. When Mr Denholm died his wife took over the licence and sold up shortly afterwards. In 1858 James Boag took over the running of the old pub which was then called the Old Blythswood Bar. The old building was demolished and a new tenement with a pub on the ground floor was erected in 1905. James Boag’s nephew George Blair took over the licence in 1891 and when the new pub was built he became the new tenant. George also ran a pub at 164-66 Paisley Road West, many will remember this old pub as the Planatation Inn. 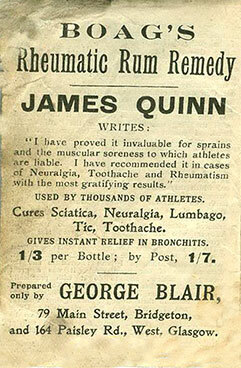 This early advert Boag’s Rheumatic Rum Remedy. When George died his wife took over the running of the pub during the 1930s. His son George then took over after the Second World War. It was finally sold to Mr Anderson after over one hundred years in the same family. Other names this old pubs had… The George, Old Blythswood Bar, and George Blair. The Park Lane Tavern, August 2005.